An insight into the mind, mechanics and devilry of a card cheat. "...It was 13 years ago today when I almost lost my life cheating at cards, and what more poignant a day to release a book on the subject. It is a hope that How to Cheat at Cards will be one of my final publications on deception with playing cards. The book began in 1995 as The Card Cheat Handbook and as it offers no new light on card table artifice, it always remained in my private journals. As I dedicate more and more time to other obsessions in the deceptive practices, I am inevitably moving slowly away from the small branch of deception with playing cards, and this is a book that I would have regret never sharing during my time in the art. 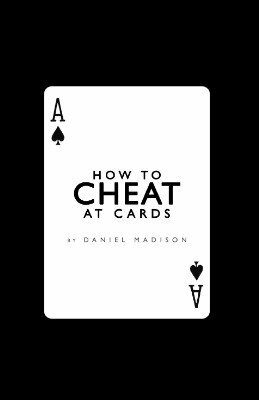 How To Cheat At Cards by Daniel Madison exposes and teaches the cheating techniques that Madison had been successful with during his time as a card cheat. The ebook offers intricate detail and step-by-step instructions on the handling and dexterity of sleight-of-hand for card cheating, accompanied by photographical guidance. The Magician Killed The Card Cheat. The Machiavellian Method. The Madison Grip (for Dealing.) Fair Dealing. The Bottom Deal. The Greek Deal. The Second Deal. The Centre Deal. Shuffling In The Hands. The Upper Grip. The Overhand Shuffle. Retaining the Bottom Stock During The Overhand Shuffle. Retaining the Top Stock During The Overhand Shuffle. Retaining the Top Stock During The Overhand Shuffle Method 2. Retaining the Entire Order of the Deck During The Overhand Shuffle. The Chop Shuffle. Retaining the Entire Order of the Deck During The Chop Shuffle. The Riffle Shuffle. Retaining A Stock During The Overhand Shuffle. Retaining the Entire Order of the Deck During The Riffle Shuffle. The Hindu Shuffle. Retaining the Top Stock During The Hindu Shuffle. Retaining the Top Stock During The Hindu Shuffle Method 2. Retaining the Entire Order of the Deck During The Hindu Shuffle. The Hindu Cut. The False Hindu Cut. The Swing Cut. The False Swing Cut. Shuffling the Deck on the Table. The Table Riffle Shuffle. The False Table Riffle Shuffle (Push-Through) The Strip Out Shuffle. The Gamblers Cut. The Ladder Cut. The Blackjack Strip Shuffle. The Coat Shuffle. The Bottom Shuffle. Marked Playing Cards. Punch Marking. Bend Marking. Nicking. Score Marking. Blood Marking System. Bicycle Rider Back Version One. Bicycle Rider Back Version Two. Bicycle League Back. Tally-Ho Circle-Back. Tally-Ho Fan-Back. Wet. Smoke. Reflections. Peeking. The Double Bubble Peek. Table Shuffle Peeking. ITH Shuffle Peeking. The Diagonal Cop. The Gamblers Cop. The Dead Bug. Rear Load Palm. The Click Lap. The Running Lap. Hold ‘Em Out. he Drop Concept. The Drop Concept. The Classic Pass. Stalling Pass. Covered Table Pass. The Frank Hop. The Madison Shift. The Blackout Table Shift. The Code. The Opportunist. Tells. Forcing the Tell. Lost and Found. Bluffing. Forcing the Bluff. The Advocate. Hustles. Poison. The Decoy. Whisky Down. Splash Loss. False Exchange. 1st edition 2011, 172 pages; revised edition 2015, 257 pages.